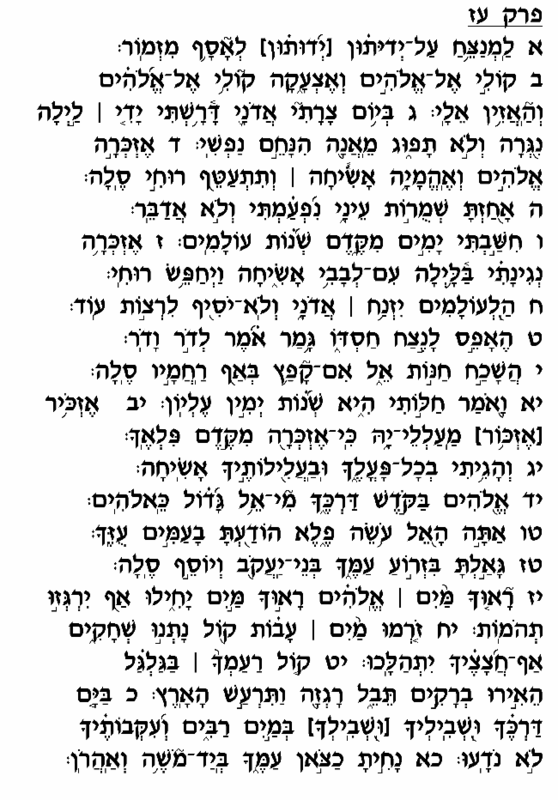 The opening verse of chapter 77 introduces this Psalm by describing it as "Al Yedutun," which Rashi explains as a reference to the trials and tribulations that the Jewish nation endures. Thus, this chapter was written to provide a certain perspective regarding the proper response to situations when Am Yisrael faces crisis and hardship, Heaven forbid. Assaf, the author of this chapter, begins by describing his ongoing sense of anxiety and sorrow, and his inability to find solace or consolation. The overbearing burden of worry and concern does not allow him to sleep peacefully (verse 5), and evokes within his mind nostalgic memories of his more peaceful, serene past (verses 6-7). 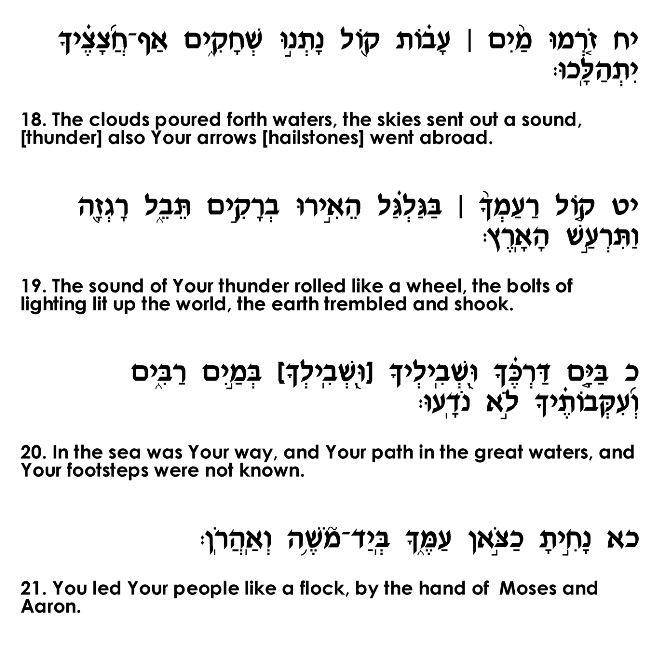 Assaf's mood appears to begin changing in verse 12, when he begins contemplating the wonders God performed in years past, focusing his attention specifically on the miracle of the splitting of the sea. That event, perhaps more so than any other miracle God performed for His people, demonstrates His unlimited ability to bring deliverance even in situations where no solution appears on the horizon, where no possible means of escape can be seen. Bene Yisrael were trapped between the sea and the pursuing Egyptian army; they had nowhere to go. But just when all hope seemed lost, God rescued them in a manner they could never have previously imagined. Assaf thus naturally looks to this event as a source of hope and encouragement during the darkest hours of the Jews' exile. 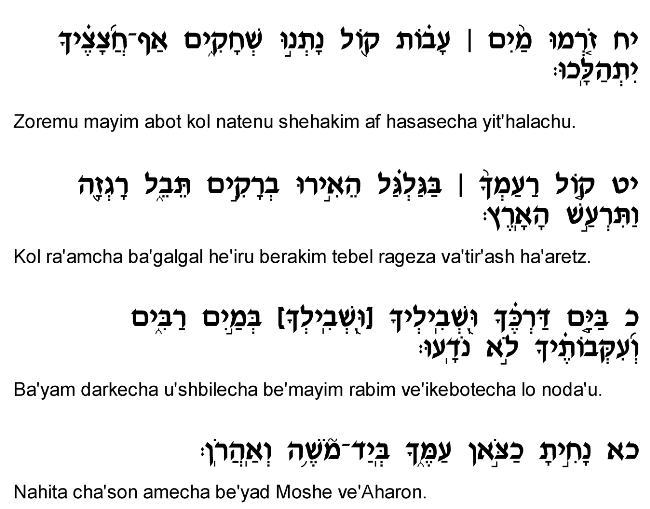 He concludes this Psalm by reminiscing about God's care for Bene Yisrael in the wilderness, under the leadership of Moshe and Aharon (verse 21). During periods of anguish and despair, God has always provided capable leaders to help the nation navigate through crises and find their way to safe, secure shores. Just as God sent Moshe and Aharon to lead and sustain Bene Yisrael during their perilous journey through the wilderness, so are we guaranteed to always have qualified national leaders to help us survive the equally perilous journey through exile.